Wash and dry 4 baking potatoes. Pierce with fork in several places to allow steam to escape during cooking. 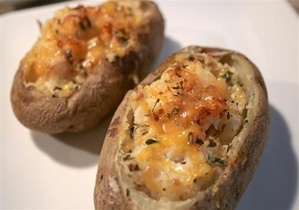 Bake potatoes in oven at 350° for 1 hour, or until soft. Remove from oven and cool slightly. Cut potatoes in half, lengthwise, and scoop out the inside leaving a thin shell. In a medium bowl, mash potatoes adding milk, butter, sour cream and dip mix, add more milk if needed. Fill potato skins with mashed potato mixture. Set on cookie sheet or prepared plank. Grill or bake at 375° for 10 to 15 minutes. Options: Cream Cheese, shredded cheese, bacon bits, BBQ meats, or be creative!